The Safe n' Simple Peri-Stoma Wipes cleans and removes adhesive without leaving an oily residue on your skin, helping your pouch stick better. It is a convenient moist travel pack. Safe n' Simple Peri-Stoma Wipes and Adhesive Remover is an alcohol-free skin cleanser and adhesive removing liquid absorbed into large soft wipes. 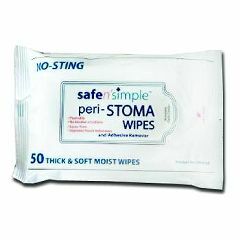 These convenient wipes are gently, clean the Peri-Stoma skin, emulsify adhesives and does not leave an oily residue.